The cell membrane of the bacterium twists and turns to provide its unique shape. Researchersstudying life in the deep subsurface of our planet have discovered a uniquebacterium living 1 mile (1.7 km) below the Earth's surface. The tiny bacteria live in acommunity of subsurface microbes inhabiting a South African platinum mine. The deepsubsurface of Earth harbors manyunique microbes that are only accessible through large scale drillingprojects or mining. By trekking into the ultra-deep mines of SouthAfrica, researchers are getting a rare glimpse into this unique habitat. Inthe depths of South Africa's Northam Platinum mine, scientists from the University of Western Ontario and Princeton University have gained access to many previouslyundiscovered microbial communities. Whilemining and drilling allow scientists to sample the unique environment below theEarth's soil, these activities obviously disturb the subsurface of the planet.Digging into the ground disrupts the microbial communities that live there.When people enter mines and caves, they bring with them a massive number ofnon-native microbes. Because of this, it's difficult to get uncontaminatedsamples. The teamfrom the recent study decided to test samples from mines in order to determinejust how contaminated they really are. They collected samples from slime, or biofilm, growing onthe walls of the Northam mine in South Africa. ?An explosion of life occurswhere subsurface water leaks out of the mine walls and meets with oxygen,leading to films of microscopic organisms. Previously,researchers overlooked these biofilms because they thought the films would betoo heavily contaminated. To test this theory, the team determined whether ornot their biofilms were formed by contaminant organisms from the surface, or byunique subsurface organisms. The study,by Greg Wanger, Tullis Onstott and Gordon Southam, was published in a recentedition of the journal Geobiology. The authorsshowed that the biofilms contained a number of unique organisms associated withthe deep subsurface, and therefore such films might be an excellent place tosearch for new and unusual species of microbes. In fact, in their study theteam came across one particularly strange microbe shaped like a tiny,microscopic star. Microbescome in a number of shapes and sizes, but most of these shapes are ratheruncomplicated. The easiest shape for a microbe to make is a sphere. Like a soapbubble, the cell membranes of microbes tend to naturally form this simplestructure due to forces such as surface tension. Accordingto the research team, "the diversity of all bacterial shapes is moredifficult to explain." Other shapes often seen in microbes include rodsand spirals, but these take a bit of extra work on the part of the microbe. Tomake more complicated shapes, microbes have to use extra energy to fightagainst the natural forces that favor the sphere. According to the researchteam, the biofilms from Northam mine "contained a morphologically diverseassortment of bacteria." Some raremicrobes go beyond the common and form radically unique shapes. The microbediscovered in the depths of the Northam mine is one such microbe. Usinghigh-powered microscopes, the team captured images that show star-shaped cellswith four to nine points. It's a unique structure for a microbe and one that hasnot been witnessed before. So whywould a microbe want to take the shape of a star? Manymicrobes "eat" by letting nutrients diffuse through their cellmembrane. A sphere may be easy to form, but it doesn't provide the largestsurface area for a cell. By forming a more complicated shape, with a cell wallthat folds and bends, the surface area of the cell is increased in relation toits interior volume. This means there's more cell wall through with the microbecan absorb its food. 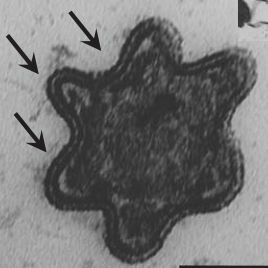 The newmicrobe discovered by the researchers in South Africa has likely developed itsunique shape in response to its unique environment. The deep subsurface of theplanet is thought to be quite "nutrient poor" — there's not a lot offood to go around. Microbes need to develop clever strategies to out-competetheir neighbors.? The surface-area-to-volume ratio for the star-shaped cells isthought to be as much as ten times better than common bacteria like e. coli.This advantage may help the stars survive amidst a neighborhood of microbescompeting for the same food. Scientistsare just beginning to understand the unique types of life beneath the surfaceof our planet. Astrobiologistsare particularly interested in the subsurface because it can help themunderstand how microbes might survive deep beneath the topsoil of otherplanets. Upcomingand current missions to search for signs of past or present life on Mars arefocusing on life beneath the martian soil. Right now, NASA's PhoenixLander is using a scoop to dig on Mars. Recent images returned from Phoenix are already revealing clues about subsurface ice on the red planet. TheEuropean Space Agency's ExoMarsrover may take the exploration of Mars' subsurface one step further. Currentplans are to place a drill on ExoMars that could allow the rover to dig up to12 feet. NASA has also been developing prototype drills for use byhuman explorers on Mars. Drilling technologies have already been tested by NASAresearchers in extreme environments on Earth, including the Canadian higharctic. Microbesuse many methods to survive in the nutrient-poor, oxygen-free, pitch-blackworld deep beneath our feet. Studying these microbes might provide clues abouthow organisms could live in harsh environments on other planets like Mars.Because of this, unique microbes like the "stars" of Northam mine mayshed a bit of light on the future of planetary exploration.